Bed and breakfast in Newcastle upon Tyne. Newcastle is the main city in the north - east of England, the River Tyne itself passes through a gorge between Newcastle (on the north bank) and Gateshead (south of the river), famous for a series of dramatic and notable bridges such as the Tyne Bridge, High Level Bridge and an innovative tilting bridge, the Gateshead Millennium Bridge, a work of art in itself. The word Geordie is used these days as an informal and affectionate term for Newcastle's inhabitants. Newcastle has been been an important industrial and commercial centre over the centuries, the main industries have been based around the exporting of coal, steel manufacturing, shipbuilding and engineering. Also see Newcastle upon Tyne & Newcastle upon Tyne attractions. If you are in the right town but cannot find the accommodation you want on this page, you might consider Newcastle hotels. Less than a mile (under 1.6 km) from central Newcastle, this new establishment offers a range of accommodation supported by convenient facilities and a secure car park. With single, double, twin and quad rooms on offer, whatever your circumstances you should find a room to suit your needs. En suite or shared bathrooms are complemented by 27-inch plasma-screen TVs with Freeview, as well as hairdryers, ironing equipment and tea/coffee making facilities. The hotel lobby is equipped with a pool table and 2 large plasma-screen TVs. Set within a beautiful Grade II listed building on Newcastle's bustling Quayside, this Boutique-style hotel provides the ideal base for both business and leisure visitors to this vibrant northern city. Each room at The Waterside has been newly refurbished to offer a bespoke style, complete with a range of modern comforts, including satellite TV channels. The hotel also offers the stylish Jimmyz Bar, which serves an extensive cocktail list, and the Sea nightclub, perfect for dancing the night away. Both have special deals, available from reception. The city centre is just an 8 minute walk away from The Waterside Hotel. Here you can enjoy an excellent choice of shopping and entertainment, including shows at the Theatre Royal, which brings in talents such as Opera North and The Royal Shakespeare Company. The Brighton is a long-established guest house within easy reach of city-centre restaurants, bars and nightlife. A warm welcome is offered at The Brighton, where the rooms are clean and well maintained. Enjoy a full English breakfast to start your day in Newcastle. This hotel offers a friendly welcome to the city centre of Newcastle upon Tyne, close to bars, clubs and restaurants. The Surtees Hotel has 27 rooms, along with 2 conference rooms which can host both small and large meetings or functions. There is a 24-hour reception and a licensed bar. It is situated only a few minutes from the central railway station and the Eldon Square shopping centre. Situated in the city centre, this hotel is next to Eldon Square shopping centre, a short walk from the Quayside, metro station and Newcastle Central Train Station. Some of the comfortable rooms at Premier Inn Newcastle City Centre can accommodate 2 adults and 2 children (under 16 years). The 2 children are also served a free full breakfast, when accompanied by an adult eating a full breakfast. The full all-you-can-eat breakfast includes cooked items, vegetarian options and a wide continental selection. Enjoy a meal in the contemporary hotel bar and restaurant, serving a varied menu in a relaxing environment. There is a 24-hour reception at this Premier Inn. On the outskirts of the city. Metro Inns Newcastle is your premier choice for cheap hotel accommodation whether your travel is for business or holiday. Our clean hotel is based in a convenient location for Newcastle with good rail and road links. Take a break from other expensive hotels, motels, guest houses and bed and breakfasts and try our cheap, clean and friendly hotel. Rooms Inn offers modern bedrooms and free Wi-Fi, close to Newcastle Central Railway Station and within walking distance of Newcastle city centre. Newcastle College is located opposite. The en suite rooms include a TV and tea/coffee facilities. Rooms Inn has a spacious private car park that is free of charge. The Metro shopping centre is within a 10-minute drive of Rooms Inn. On the quayside and with fabulous views of the River Tyne, the hotel is just 5 minutes' walk from the city centre and offers comfortable, great-value modern en suite rooms. The Premier Inn Newcastle Quayside is within easy reach of the A1 and just 650 metres from Newcastle Central Railway Station. Situated between the two major business parks, the hotel is adjacent to the Sage Gateshead concert hall and just 10 minutes from the Metro Radio Arena Newcastle. The hotel has a 24-hour reception desk and some rooms can take 2 adults and up to 2 children (under 16 years). In the heart of Newcastle city centre, adjoining the central train station and Metro system, Royal Station Hotel is very well located and has an indoor swimming pool and free Wi-Fi. Royal Station Hotel has spacious en suite rooms include complimentary mineral water and fruit juice in the minibar. There is a 24-room service menu. There is a choice of 10 conference rooms, the largest catering for up to 200 delegates. Stag parties and groups at weekend: please contact the hotel after your booking has been made, as a security deposit is required. With a superb location in the heart of Newcastle's city centre, this well-placed hotel is a short walk from Newcastle Central Railway Station and many shops. 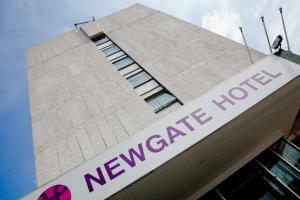 The Newgate Hotel Newcastle is easily accessible from the A167 and has its own car park. Nearby Newcastle Central Railway Station also offers access to the Tyne and Wear Metro system for travel in the surrounding area. The Newgate and Eldon Square shopping centres are very nearby. There are many restaurants and bars to choose from at The Gate, which is 100 metres from the hotel. Breakfast is served in the rooftop restaurant where you can enjoy panoramic views of the city. Free Wi-Fi is available both in the hotel lobby and in the Terrace Bar. This great-value hotel is in the city centre, 500 metres from Newcastle Rail Station. It has large and light en suite rooms with air conditioning, power showers and satellite TV. All of the Jury Inn's rooms can accommodate up to three adults or two adults and two children. Each room has a spacious work area, hairdryer and tea/coffee. The modern Innfusion Restaurant offers breakfast and dinner. The more informal Inntro Bar serves bar food and drinks. There is also the Il Barista Cafe, with snacks, pastries and coffees. The Jurys Inn Newcastle is a short walk from all of the shops, bars and restaurants. The Centre for Life science centre is 200 metres away and Newcastle United Football Club is 900 metres from the hotel. Newcastle is known for its vibrant nightlife and has been voted one of the UK's leading destinations for Stag and Hen parties. Just 1 mile from Newcastle city centre, the family-run Bentleys Hotel and Coffee Shop offers modern en suite rooms with TVs. Bentleys Hotel offers free private parking. Bentleys Hotel has a guest lounge and a dining room. A full English breakfast is provided. Bentleys Hotel is near excellent transport links to the city centre. Newcastle United F.C Stadium is less than a mile away. A converted church, the Bluebird Hotel offers budget accommodation 10 minutes' drive from Newcastle Airport and 2.6 miles from the city centre. Free parking and free Wi-Fi are available. Groups and families are welcome at the Bluebird. The hotel offers regular entertainment including a movie lounge with a large screen. Communal kitchens are available for guests who wish to prepare their own food. Laundry facilities are available on site and the hotel gardens are open to guests. Rooms at the Bluebird Hotel have modern furnishings and some have en suite bathrooms. All rooms have a TV and work desk. Linens and towels are provided. Newcastle is well-known for its pubs and nightclubs and the city centre is easily accessible by bus or taxi. Newcastle University and Newcastle Football Club are both 2.5 miles away.